The second Pitch Perfect movie was an even bigger hit than the first and the songs are just as catchy. "Bella's Opening " - the girls are back for their senior year and better than ever with a modern pop medley fit for the President? until Fat Amy ruins everything. Sing the arrangement that the Bellas sang, wardrobe malfunction optional. Songs include We Got the World, Timber, America, The Beautiful, and Wrecking Ball. "Bellas Finale " - As in the first movie, this mashup weaves together several great songs and storylines from throughout the film, with a twist of an ending. Songs include Run The World (Girls), Where Them Girls At, We Belong, We Got The World, and Flashlight. "Bellas Back to Basics" - The Bellas have lost their sound, and to find it again they sing this medley of some of the greatest and most iconic women's harmony groups from the past, from the Andrew's Sisters to En Vogue. Songs include Boogie Woogie Bugle Boy, You Can't Hurry Love, Lady Marmalade, and My Lovin'. "Cups" - The trailer for the highly anticipated Pitch Perfect 2 gives us a sneak peek at the music for the new film, including this expanded version of Anna Kendrick's breakout hit Cups. After a sweet, reflective opening verse, it moves into tempo for a more expanded treatment. Remember the scene in Pitch Perfect where Beca first teaches the Barden Bellas how to sing a mashup? This is that exact arrangement of "Just the Way You Are/Just a Dream " from the movie, distilled into 4-part harmony plus duet. Vocal percussion optional. "Cups" is the irresistible break-out hit by Anna Kendrick from the Pitch Perfect soundtrack has a sweet folky flavor and the fun "cup" accompaniment will be a hit with your choir! Now crossing over to YouTube and mainstream radio, the song is getting major attention in the media. May be performed a cappella or accompanied. 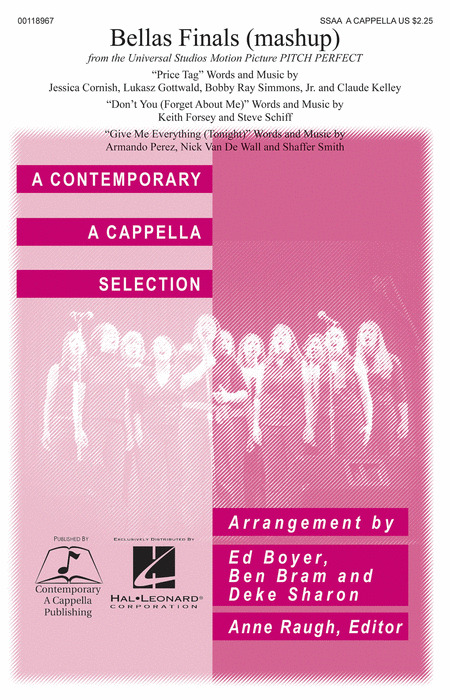 "Bellas Finals" - Perhaps the biggest a cappella moment in modern cinema, the Barden Bellas win the ICCAs with this exact full-length arrangement from the movie Pitch Perfect, distilled into 4-part harmony plus solo. Vocal percussion optional. One of the highest grossing musical comedies of all time, Pitch Perfect tells the story of The Barden Bellas, an all-girl college a cappella group, as they compete against another group from their college to win Nationals. The Barden Bellas are back with a baker's dozen of piano/vocal/guitar arrangements of the a cappella songs presented in this sequel to Pitch Perfect. The Bellas are back for their senior year and better than ever with a modern pop medley fit for the President? until Fat Amy ruins everything. Sing the arrangement that the Bellas sang, wardrobe malfunction optional. Songs include We Got the World, Timber, America, The Beautiful, and Wrecking Ball. The Bellas have lost their sound, and to find it again they sing this medley of some of the greatest and most iconic women's harmony groups from the past, from the Andrew's Sisters to En Vogue. Songs include Boogie Woogie Bugle Boy, You Can't Hurry Love, Lady Marmalade, and My Lovin'. As in the first movie, this mashup weaves together several great songs and storylines from throughout the film, with a twist of an ending. Songs include Run The World (Girls), Where Them Girls At, We Belong, We Got The World, and Flashlight. Perhaps the biggest a cappella moment in modern cinema, the Barden Bellas win the ICCAs with this exact full-length arrangement from the movie Pitch Perfect, distilled into 4-part harmony plus solo. Vocal percussion optional. The film Pitch Perfect presents the world of collegiate a cappella groups with a comedic flair and musical sassiness that your pop ensembles will love to recreate! Whether a cappella or accompanied, here is the Bellas' terrific mash-up, including: Don't You (Forget About Me), Give Me Everything (Tonight), Price Tag. The film Pitch Perfect presents the world of collegiate a cappella groups with a comedic flair and musical sassiness that your pop ensembles will love to recreate! 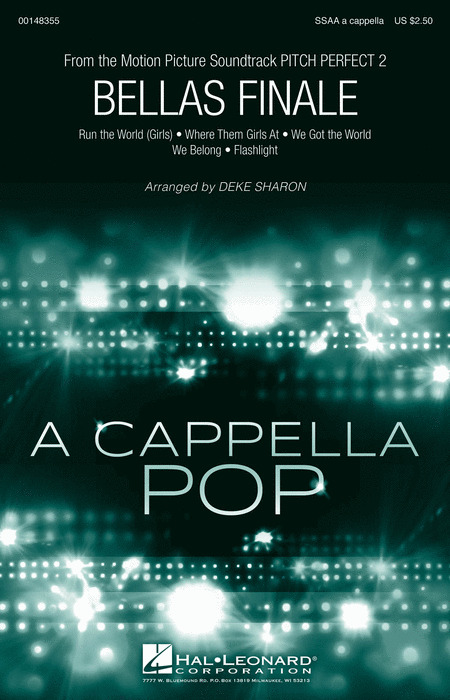 Whether a cappella or accompanied, here is the Bellas' terrific mash-up, including: Don't You (Forget About Me), Give Me Everything (Tonight), Price Tag. Perhaps the biggest a cappella moment in modern cinema, the Barden Bellas win the ICCAs with this exact full-length arrangement from the movie Pitch Perfect, distilled into 4-part harmony plus solo. Vocal percussion optional. 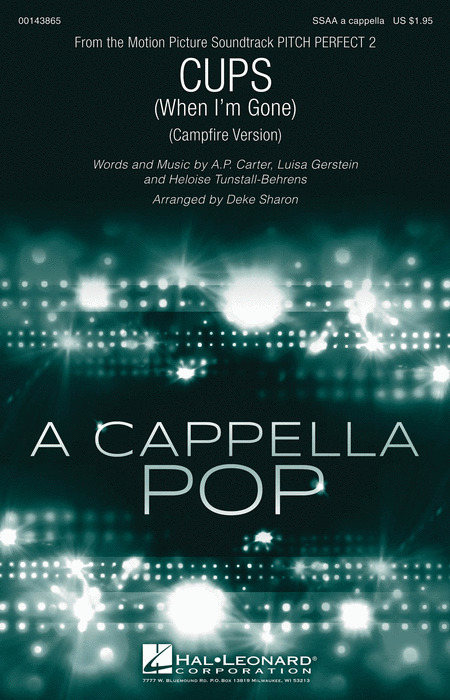 The irresistible break-out hit by Anna Kendrick from the Pitch Perfect soundtrack has a sweet folky flavor and the fun "cup" accompaniment will be a hit with your choir! Now crossing over to YouTube and mainstream radio, the song is getting major attention in the media. 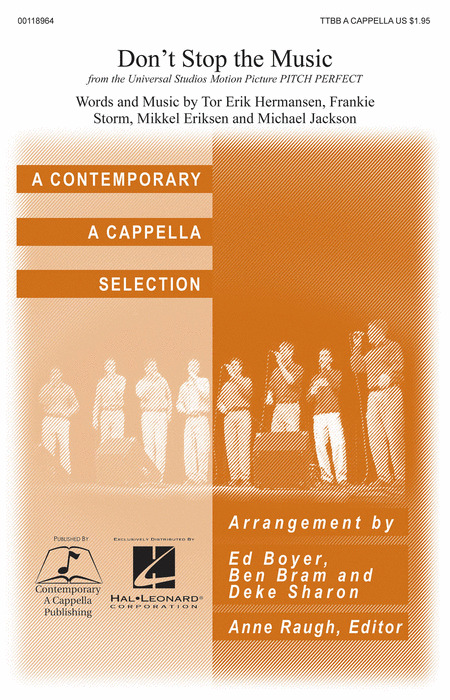 May be performed a cappella or accompanied. 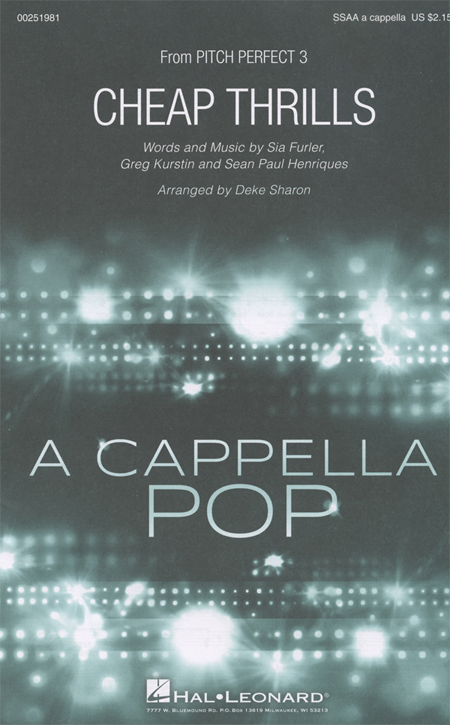 The irresistible break-out hit by Anna Kendrick from the Pitch Perfect soundtrack has a sweet folky flavor and the fun cup accompaniment will be a hit with your choir! Now crossing over to YouTube and mainstream radio, the song is getting major attention in the media. May be performed a cappella or accompanied. The trailer for the highly anticipated Pitch Perfect 2 gives us a sneak peek at the music for the new film, including this expanded version of Anna Kendrick's breakout hit Cups. After a sweet, reflective opening verse, it moves into tempo for a more expanded treatment. From the popular movie Pitch Perfect, this irresistible vocal arrangement of the 2008 chart hit by Rihanna is unstoppable! Featured in Pitch Perfect 2 at the heartwarming conclusion to the film, this song by British pop sensation Jessie J offers a musical and emotional impact that is instantly appealing. Weaving through the entire film and later crossing over to the pop charts, this song has enduring power to engage singers and audiences. Now available for SSA! Featured in Pitch Perfect 2 at the heartwarming conclusion to the film, this song by British pop sensation Jessie J offers a musical and emotional impact that is instantly appealing. Weaving through the entire film and later crossing over to the pop charts, this song has enduring power to engage singers and audiences. Remember the scene in Pitch Perfect where Beca first teaches the Barden Bellas how to sing a mashup? This is that exact arrangement from the movie, distilled into 4-part harmony plus duet. Vocal percussion optional. Deke Sharon : Party in the U.S.A.
Miley Cyrus' pop hit from 2009 as arranged for the Pitch Perfect movie soundtrack is a cute novelty feature for SSA a cappella groups. Fun to learn and fun to perform! Kelly Clarkson's mega hit from 2004 rocks out in this a cappella rendition from the Pitch Perfect soundtrack!